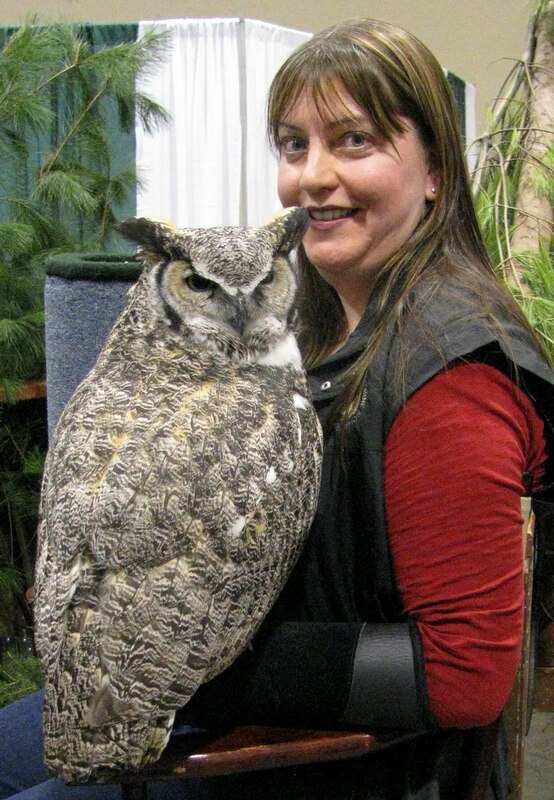 Alexandra is a 13 year old female Great Horned Owl, and it was an honour to hold her. It's funny how sometimes the pieces of your life seem to fall into place nicely once in a while. That's how I'm feeling after reflecting on this past weekend. 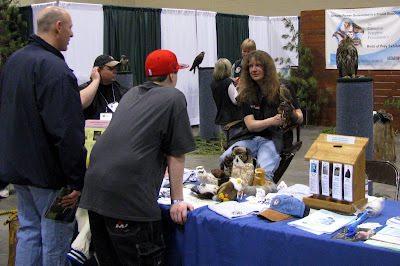 Wednesday night we had an e-mail from one of the ladies we met on the Authentic Canadian Tours "Eagles and Owls" birding trip, wanting to know if we'd be interested in volunteering for the Canadian Peregrine Foundation over the weekend at the Toronto Sportsman Show. We weren't sure what we would be doing, but were willing to help as we planned on going to the show to see their educational display birds on the Friday night anyway. You could of knocked me over with a feather when Frank, one of CPF's many volunteers, who we also met on the birding trip, told me we'd get to display some of the birds! 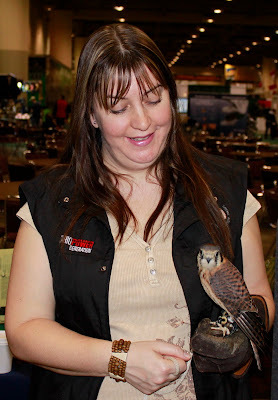 I got to display Kyla, an American Kestrel for a little while on Friday. Rob forgot all about his shyness when it came too talking to complete strangers about one of his loves, birds! We volunteered to work both Friday night and all day Saturday, but it sure didn't seem like work. 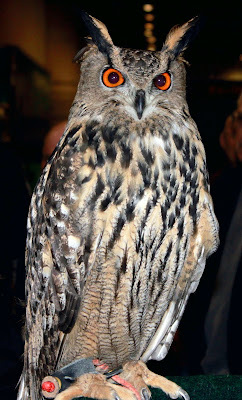 To be so close to so many different raptors; Eagles, Owls, Hawks, and Falcons, it felt like a gift to us. Bubo, "Boo" to his friends, is a male European Eagle Owl and was very popular at the show as he was "Who-Hooing" quite often. I still can't quite believe that I got to hold a Great Horned Owl, and we got to be so close to "Boo", an Owl that Rob made a special visit to the Kortright Centre just to see in his enclosure a few months ago. Little did he know that one day he'd be nose to beak with him. Rob got to display Kyla, most of the day on Saturday. We've been talking about doing some volunteer work with an animal organization for a while now, but it's difficult when we both work full time and different shifts, but I'm happy to say we seemed to of found a fit with The Canadian Peregrine Foundation. After talking with the Founders, Mark and Marion Nash, and also Tracy, who's in charge of volunteering at the Kortright Centre, where the birds are housed, we'll be starting our volunteering for them next month. I was still kind of in awe of holding Kyla on Saturday. See what I mean about the puzzle of life fitting together easily sometimes? We see a post on the birding message board about a trip, we sign up for it, on that trip we meet Ann and Frank, three weeks after that trip they contact us about volunteering this weekend at the show, and now we found a place for us to do some volunteer work on a more regular basis for something we're so passionate about. It's almost like it was meant to be. Wonderful photos and glad you enjoyed it. 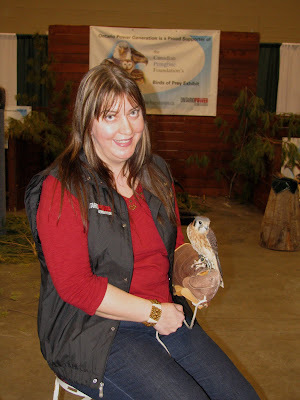 I just love doing this show with the Canadian Peregrine Foundation who do amazing work and save many a bird. Mark and Marion are totally dedicated to the CPF. The bonus of working the show is maybe getting to hold a hawk or owl. You have a beautiful smile Angie and that owl was amazing. It was great to see you both again. Thank you Murray for the introduction. Im so glad you and Rob got the chance to help out at the show,it was much appreciated. Seeing my new friends enjoy themselves so much really made the show for me. Its great that everyone who came out is committing some time at fledge time and that you are going to try to work something out at the barn. Thanks again to you both! Congratulations to you and Rob on finding your calling. You both look like PRO Raptor Handlers.